Any neoplasm of lymphoid or reticuloendothelial tissues; in general use, synonymous with malignant lymphoma; present as apparently solid tumors composed of cells that appear primitive or resemble lymphocytes, plasma cells, or histiocytes. Lymphomas appear most frequently in the lymph nodes, spleen, or other normal sites of lymphoreticular cells; may invade other organs or manifest as leukemia. Lymphomas are now classified by histology, immunophenotype, and cytogenetic analysis, according to cell of orgin (B or T cells) and degree of maturation. The current World Health Organization (WHO) classification of lymphoid neoplasms is based on the Revised European-American Lymphoma (REAL) classification and effectively replaces older schemes such as the Working Formulation and Rappaport classification, which were based solely on morphology. See also: International Prognostic Index. /lym·pho·ma/ (lim-fo´mah) any neoplastic disorder of lymphoid tissue. Often used to denote malignant l., classifications of which are based on predominant cell type and degree of differentiation; various categories may be subdivided into nodular and diffuse types depending on the predominant pattern of cell arrangement. adult T-cell lymphoma , adult T-cell leukemia/lymphoma see under leukemia. B-cell lymphoma any in a large group of non-Hodgkin's lymphomas characterized by malignant transformation of the B lymphocytes. B-cell monocytoid lymphoma a low-grade lymphoma in which cells resemble those of hairy cell leukemia. Burkitt's lymphoma a form of small noncleaved-cell lymphoma, usually occurring in Africa, manifested usually as a large osteolytic lesion in the jaw or as an abdominal mass; Epstein-Barr virus has been implicated as a causative agent. centrocytic lymphoma mantle cell l.
convoluted T-cell lymphoma lymphoblastic lymphoma with markedly convoluted nuclei. cutaneous T-cell lymphoma a group of lymphomas exhibiting (1) clonal expansion of malignant T lymphocytes arrested at varying stages of differentiation of cells committed to the series of helper T cells, and (2) malignant infiltration of the skin, which may be the chief or only manifestation of disease. diffuse lymphoma in an older classification method, malignant lymphoma in which the neoplastic cells diffusely infiltrate the entire lymph node, without any definite organized pattern. follicular lymphoma any of several types of non-Hodgkin's lymphoma in which the lymphomatous cells are clustered into nodules or follicles. follicular center cell lymphoma B-cell lymphoma classified by the similarity of the cell size and nuclear characteristics to those of normal follicular center cells; the four previous subtypes are scattered among several types of follicular and diffuse lymphomas. giant follicular lymphoma follicular l.
histiocytic lymphoma a rare type of non-Hodgkin's lymphoma characterized by the presence of large tumor cells resembling histiocytes morphologically but considered to be of lymphoid origin. Hodgkin's lymphoma see under disease. intermediate lymphocytic lymphoma , lymphocytic lymphoma, intermediately differentiated mantle cell l.
large cell lymphoma any of several types of lymphoma characterized by the formation of one or more types of malignant large lymphocytes, such as large cleaved or noncleaved follicular center cells, in a diffuse pattern. large cell, immunoblastic lymphoma a highly malignant type of non-Hodgkin's lymphoma characterized by large lymphoblasts (B or T lymphoblasts or a mixture) resembling histiocytes and having a diffuse pattern of infiltration. Lennert's lymphoma a type of non-Hodgkin's lymphoma with a high content of epithelioid histiocytes and frequently with bone marrow involvement. lymphoblastic lymphoma a highly malignant type of non-Hodgkin's lymphoma composed of a diffuse, relatively uniform proliferation of cells with round or convoluted nuclei and scanty cytoplasm. malignant lymphoma a group of malignancies characterized by the proliferation of cells native to the lymphoid tissues, i.e., lymphocytes, histiocytes, and their precursors and derivatives; the group is divided into two major clinicopathologic categories: Hodgkin's disease and non-Hodgkin's lymphoma. mantle cell lymphoma , mantle zone lymphoma a rare form of non-Hodgkin's lymphoma having a usually diffuse pattern with both small lymphocytes and small cleaved cells. marginal zone lymphoma a group of related B-cell neoplasms that involve the lymphoid tissues in the marginal zone, the patchy area outside the follicular mantle zone. mixed lymphocytic-histiocytic lymphoma non-Hodgkin's lymphoma characterized by a mixed population of cells, the smaller cells resembling lymphocytes and the larger ones histiocytes. non-Hodgkin's lymphoma a heterogeneous group of malignant lymphomas, the only common feature being an absence of the giant Reed-Sternberg cells characteristic of Hodgkin's disease. plasmacytoid lymphocytic lymphoma a rare variety of small lymphocytic lymphoma in which the predominant cell type is the plasma cell. primary effusion lymphoma a B-cell lymphoma associated with human herpesvirus 8 infection, characterized by the occurrence of lymphomatous effusions in body cavities without the presence of a solid tumor. small B-cell lymphoma the usual type of small lymphocytic lymphoma, having predominantly B lymphocytes. small cleaved cell lymphoma a group of non-Hodgkin's lymphomas characterized by the formation of malignant small cleaved follicular center cells, with either a follicular or diffuse pattern. small lymphocytic lymphoma a diffuse form of non-Hodgkin's lymphoma representing the neoplastic proliferation of well-differentiated B lymphocytes, with focal lymph node enlargement or generalized lymphadenopathy and splenomegaly. small lymphocytic T-cell lymphoma small lymphocytic lymphoma that has predominantly T lymphocytes. small noncleaved cell lymphoma a highly malignant type of non-Hodgkin's lymphoma characterized by the formation of small noncleaved follicular center cells, usually in a diffuse pattern. T-cell lymphomas a heterogeneous group of lymphoid neoplasms representing malignant transformation of the T lymphocytes. U-cell lymphoma , undefined lymphoma a category of non-Hodgkin's lymphomas that cannot be classified into a definite type by either morphologic or known immunocytochemical markers. undifferentiated lymphoma small noncleaved cell l.
a type of neoplasm of lymphoid tissue that originates in the reticuloendothelial and lymphatic systems. It is usually malignant but in rare cases may be benign. It usually responds to treatment. Two main kinds of lymphomas are Hodgkin's disease and non-Hodgkin's lymphoma (NHL). A third form, Burkitt's lymphoma, is rare in North America but relatively common in Central Africa. A rare form of lymphoma is mycosis fungoides, a chronic T cell variation of the disease affecting the skin and internal organs. It is an insidious disorder, beginning as a plaquelike pruritic rash that spreads through the skin and becomes nodular and systemic. The various lymphomas differ in degree of cellular differentiation and content, but the manifestations are similar in all types. Hodgkin's disease lymphomas tend to affect young adults but usually respond to recently developed types of therapy. The NHL type usually strikes patients around middle age and can be more difficult to treat. Characteristically the appearance of a painless enlarged lymph node or nodes is followed by weakness, fever, weight loss, and anemia. With widespread involvement of lymphoid tissue, the spleen and liver usually enlarge and GI disturbances, malabsorption, and bone lesions frequently develop. Men are more likely than women to develop lymphoid tumors. There has been a dramatic increase in the incidence of acquired immunodeficiency syndrome-related NHL, which is attributed to prolonged survival of such patients related to the availability of antiretroviral agents. Treatment for lymphoma includes intensive radiotherapy, chemotherapy, and biological therapies, including interferon and monoclonal antibodies. Kinds of lymphoma include Burkitt's lymphoma, giant follicular lymphoma, histiocytic malignant lymphoma, Hodgkin's disease, and mixed cell malignant lymphoma. Formerly called leukosarcoma. -lymphomatoid, adj. Oncology A malignant neoplasm of B or T lymphocytes, arising from a monoclonal, ie derived from a single progenitor cell, proliferation of lymphocytes; the proliferative process is considered lymphomatous in the appropriate clinical setting, given that not all monoclonal expansions are malignant Clinical Painless swelling of lymph nodes in neck, underarm, groin Prognosis Favorable in follicular lymphomas, especially cleaved, mixed and large non-cleaved cell types; some diffuse lymphomas–eg, small lymphocytic, cleaved cell, Burkitt's, non-cleaved cell and convoluted cell types, have OK-ish prognoses; Ls with poor prognosis include diffuse plasmacytoid lymphocye, mixed cell, mixed small noncleaved cell and large noncleaved cell types; advanced age, anemia and high mitotic activity are associated with a poor prognosis. See Angiotropic lymphoma, B-cell lymphoma, Biclonal lymphoma, Burkitt's lymphoma, Composite lymphoma, Cutaneous cell lymphoma, Diffuse lymphoma, Diffuse large cell lymphoma, Diffuse mixed (small & large) cell lymphoma, Diffuse small cleaved cell lymphoma, Discordant lymphoma, Extranodal lymphoma, Follicular lymphoma, Gastric lymphoma, High-grade lymphoma, Histiocytic lymphoma, Hodgkin's disease, Intermediate lymphocytic lymphoma, Ki-1 lymphoma, Large cell lymphoma with filopedia, Lennert's lymphoma, Low-grade lymphoma, Lymphoblastic lymphoma, MALToma, Mantle zone lymphoma, Mediterranean lymphoma, Monoclonality, Monocytoid B-cell lymphoma, Non-Hodgkin's lymphoma, Pediatric lymphoma, Pinkus lymphoma, Pleomorphic non-Burkitt's lymphoma, Polylobulated lymphoma, Prelymphoma, Primary lymphoma of brain, Pseudolymphoma, Pseudopseudolymphoma, REAL classification, Reversible lymphoma, Serous lymphoma, Signet ring cell lymphoma, Small lymphocytic lymphoma, Small non-cleaved cell lymphoma, T-cell lymphoma lymphoma, Testicular lymphoma, Working classification. Cf Leukemia. Any neoplasm of lymphoid tissue; in general use, synonymous with malignant lymphoma. Staging of both Hodgkin and non-Hodgkin lymphoma is as follows: Stage I: involvement of a single lymph node or localized involvement. Stage II: Involvement of two or more lymph node regions on the same side of the diaphragm. Stage III: Involvement of several lymph node regions on both sides of the diaphragm. Stage IV: Involvement of extralymphatic tissue, such as the bone marrow. A rare form of non-Hodgkin, T-cell lymphoma that may behave indolently when limited to the skin or may be more aggressive and spread to lymph nodes throughout the body. A B-cell, non-Hodgkin lymphoma found in adult and older patients. It results from a translocation of an oncogene from chromosome 14 to chromosome 18 [t(14; 18)]. Most instances of this lymphoma are indolent or slow growing. A rare, rapidly progressive lymphoma that develops in the liver, spleen, and bone marrow. It has been identified in patients taking immunosuppressive drugs for diseases such as inflammatory bowel disease. 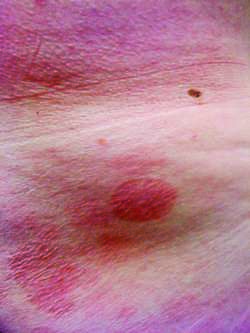 Painless lymphadenopathy in two thirds of patients is the most frequent presenting symptom. Others have fever, night sweats, and loss of 10% or more of body weight in the 6 months before presenting with symptoms of infiltration into nonlymphoid tissue. Additional involvement is in peripheral areas such as epitrochlear nodes, the tonsillar area, and bone marrow. NHL is 50% more frequent in occurrence in men than in women of similar age. In most cases the cause of NHL is unknown, but patients who have received immunosuppressive agents have an over 100 times greater chance of developing NHL, probably because the immunosuppressive agents activate tumor viruses. Specific therapy depends on the type, grade, and stage of the lymphoma. Combination chemotherapies, bone marrow transplantation, radiation therapy, and photochemotherapy may be given, depending on the specific diagnosis. A non-Hodgkin B-cell lymphoma that typically arises in body cavities such as the pleural, peritoneal, or pericardial spaces. It is caused by Kaposisarcoma herpesvirus (human herpes virus 8) and is usually found in patients with advanced immune suppression. a tumor of lymphoid tissue. A type of cancer that affects lymph cells and tissues, including certain white blood cells (T cells and B cells), lymph nodes, bone marrow, and the spleen. Abnormal cells (lymphocyte/leukocyte) multiply uncontrollably. Any neoplasm of lymphoid or reticuloendothelial tissues; in general use, synonymous with malignant lymphoma; presents as apparently solid tumors composed of cells that appear primitive or resemble lymphocytes, plasma cells, or histiocytes; appear most frequently in the lymph nodes, spleen, or other normal sites of lymphoreticular cells. n a neoplasm made up of lymphoid tissue. n a group of heterogenous lymphoid tumors generally expressing one or more B-cell antigens or representing malignant transformations of B lymphocytes. 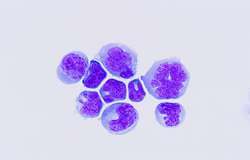 n a type of B-cell lymphoma suspected to be related to infection by the Epstein-Barr virus (EBV). The classical (African) variation usually affects the bowels, whereas the endemic variation affects the jaws. n a group of malignant B-cell lymphomas suspected of being related to the Epstein-Barr virus. Characterized by the presence of Reed-Sternberg cells. n a type of lymphoid tumor that can occur in any mucous tissue and in salivary glands. These tumors arise from benign lymphoepithelial lesions. n a group of malignant tumors of a lymphoid tissue that differ from Hodgkin disease, being more heterogeneous with respect to malignant cell lineage, clinical course, prognosis, and therapy. The only feature shared by these tumors is the absence of Reed-Sternberg cells, which are characteristic of Hodgkin disease. n an adult T-cell leukemia; an acute or chronic disease associated with a human T-cell virus, with lymphadenopathy, hepatosplenomegaly, skin lesions, peripheral blood involvement, and hypercalcemia. any neoplastic disorder of lymphoid tissue. Often used to denote malignant lymphoma, classifications of which are based on predominant cell type and degree of differentiation; various categories may be subdivided into nodular and diffuse types, depending on the predominant pattern of cell arrangement. There is also a great deal of difference in the types of disease in the different animal species. There is a system of classification based on the histological characteristics of the lymphocytes. an uncommon form of the disease seen rarely in dogs; lesions most commonly in the lungs producing a syndrome similar in many ways to congestive heart failure. the tumor form of bovine viral leukosis. the commonest hemopoietic neoplasm of dogs. It is characterized by lymphoid tumors in multiple lymph nodes, spleen, liver or other organs. Lymphocytic leukemia with involvement of bone marrow is much less common. round, raised cutaneous nodules or plaques caused by the infiltration of neoplastic lymphocytes with a tropism for epithelial cells. Occurs in cattle, dogs and humans. See also mycosis fungoides. a malignant lymphoma in which the lymphomatous cells are in clusters in the lymph node resembling follicles. Called also giant follicular lymphoma, nodular lymphoma. rare, but reported most frequently in the dog. A diagnosis depends on the identification of the Reed-Sternberg cell in a mixed population of lymphocytes accompanied by sclerosis. may be nonsecretory or may secrete immunoglobulins. See also myeloma. classified as diffuse, large cells, large cell immunoblastic or mixed tumors with large cells. tumors of medium-sized lymphocytes or small noncleaved lymphocytes. a form in which the predominant cell is the prolymphocyte (reticulum cell). a form containing proliferations of both prolymphocytes and lymphocytes. a form in which the predominant cell is morphologically similar to the lymphoblast, containing a fine nuclear chromatin structure and one or more nucleoli. the form in which the predominant cell is the mature lymphocyte. a form in which relatively large stem cells with large nuclei, pale, scanty cytoplasm and indistinct borders predominate. a form in which the predominant cell is the mature lymphocyte. occurs most commonly in yearling cattle and cats. In cattle, it causes obstruction of the esophagus leading to ruminal tympany, engorgement of jugular veins and edema of brisket and submandibular space. In cats it is caused by feline leukemia virus infection and is usually associated with pleural effusion and accompanying dyspnea and regurgitation. Q. I would like to chat with someone w/any knowledge of fibromyalgia being treated with Methadone my best friend has severe fibromyalgia and has been treated with Methadone for the past several years. She has developed severe chronic anemia in these years. She now has lymphoma. I want to know if she is the only one and if methadone can affect bone marrow. A. I have never ever heard or read anywhere about methadone causing anemia, nor is that something that an opiate medication would normally cause. We all have a tendency to blame everything that happens to us, health-wise, on methadone sometimes--but in this case, you probably need to look elsewhere for the cause. the Anemia is probably due to the Lymphoma. if not-her life is out of balance, she might changed her diet and may have shortage of iron or B12.